We have come to believe the stereotype of aging—growing older equals decline, loss of function, decrepitude, and loss of purpose. Creativity will be the first to suffer in old age, we assert. 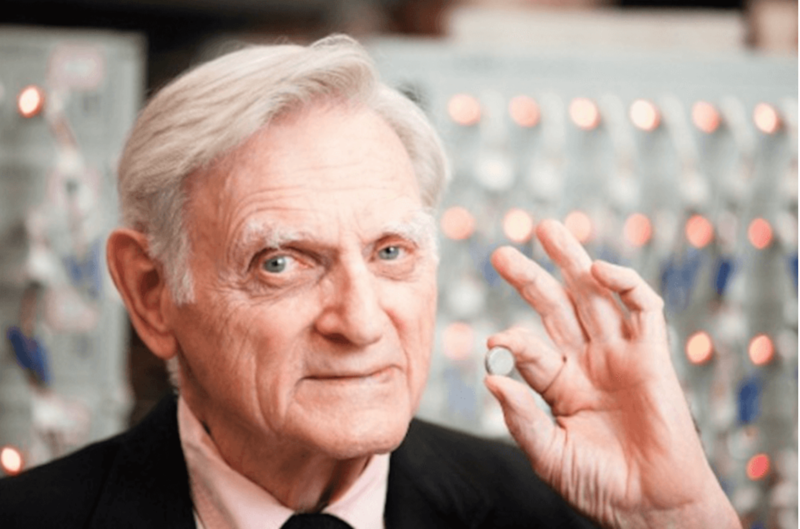 “Not so fast,” says Dr. John Goodenough, who at 94, is leading a team of engineers in Texas to develop a new solid-state battery. In 1980, when he was 58, he was the co-inventor of the lithium-ion battery. Mr. Robert Marchand, 105-year old Parisian, set a world record in January 2014 (at age 103) in indoor cycling—26,92 km in one hour. This year, at age 105, he “only” managed 22 km in one hour. He has no plan to slow down. John Bannister Goodenough was born in 1922 in Germany. He received his schooling in Massachusetts, studied at Yale, served in WWII and received his Ph.D. in physics in 1952 at the University of Chicago. He has also been involved in the development of RAM, rapid access magnetic memory. During the 1970s and 1980s, he continued his career in Inorganic chemistry at the University of Oxford. In a recent New York Times article by Pagan Kennedy, Dr. Goodenough recounts how he in 1946, at age 23, ignored his physics professor’s advice that he was already too old to make a success in the field of physics. Dr. Goodenough, professor of the Cockrell School of Engineering, and his team at the University of Texas in Austin, are now working on developing a solid-state battery that can be safer, faster-charging, and retain its charge longer than the lithium-ion battery. Their new (solid glass electrolyte) batteries have at least three times as much energy density as today’s Li-ion batteries. Dr. Goodenough pointed out the limitations of the popular Li-ion battery—it is prone to explosions, is expensive, and is too weak a design to carry the industry much further into the 21st-century. A safer rechargeable battery was required—they had to create a solid-state battery. Two years ago, when he was 92, Dr. Goodenough convinced Dr. Maria Helena Braga, a Portuguese physicist, to move to Texas and join his team. She and a colleague had created a glass-like substance that can replace liquid electrolytes—exactly what they needed in their quest to perfect the design. This new battery (that they are in the process of patenting and preparing for commercial use), is a low-cost, all-solid-state battery that is noncombustible and has a long battery life. It also has fast rates of charge and discharge. “Cost, safety, energy density, rates of charge and discharge and cycle life are critical for battery-driven cars to be more widely adopted,” Dr. Goodenough said. The energy-density of a battery cell gives an electric vehicle its driving range—a higher energy density means more mileage before recharging. A further advantage of the new batteries is it can be made from eco-friendly materials. The glass electrolytes now allow for substituting Lithium with Sodium, which is extracted from seawater—available worldwide. It seems, sometimes it pays to ignore the advice of your university professor and follow “your dreams,” your passion, and then—like good red wine, improve with age. For those considering retiring—the majority of international patent holders are aged, 46 to 60. Don’t retire just yet. You may miss the opportunity of a lifetime. Perhaps the last word has not been spoken on age and creativity. “Young people are just smarter,” was Mark Zuckerberg’s take in 2007 on youth and achievement—he was CEO of Facebook at age 22. Dr. Goodenough sees himself at 94, as a turtle and a late bloomer, who keeps going, sustained by his faith, and puts to good use the valuable experience he gained as he moved over the decades from physics into chemistry and material sciences. Don’t let anyone tell you, you’re too old. It’s a skewed perspective that you decline as you age. Don’t stop following your passion because you turn 65 or 75 or 85 or 95. “Our age is irrelevant—it does not define us,” claim Dr. Goodenough, Mr. Don Pellmann, Mr. Robert Marchand and hundreds of thousands their age. Why would you stop? Creativity improves as you age—ask Dr. Goodenough—he knows. Just. Don’t. Stop. Lynne Spreen. Are older people becoming more relevant? HM Braga, JB Goodenough. Alternative strategy for a safe rechargeable battery. J Energy & Environmental Science 2017.